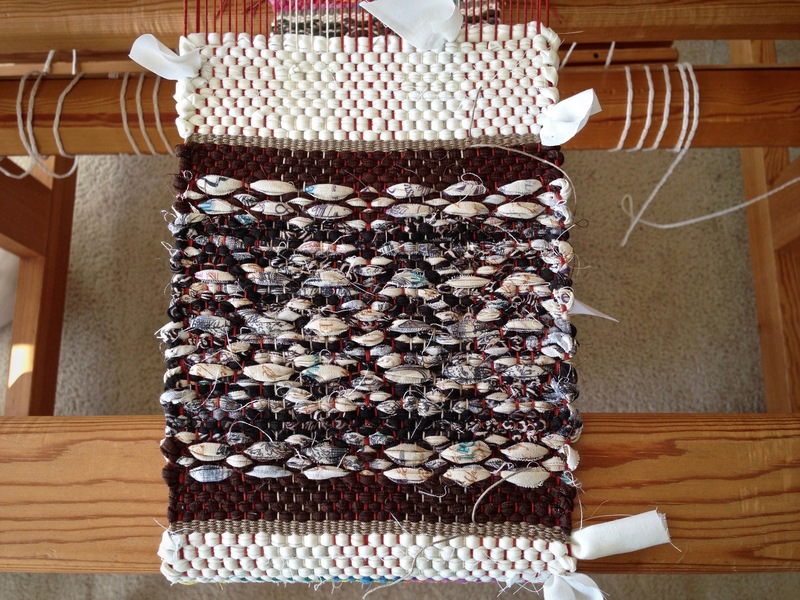 Mug rug is being woven using string yarn for the weft. I have a new project I’m excited about. That’s all the motivation I need to get the current project off the loom. The thread for the new project will be here soon. A new warp is celebration time! It means more weaving. But the aim of weaving is always to make cloth. Whether tiny rugs or monksbelt yardage, everything I weave eventually gets cut off. And for a weaver, the cutting off is party time, too! That’s when we get to see and touch the results of our efforts. Rosepath mug rug, woven with fabric strips. White scrap header is removed during finishing. 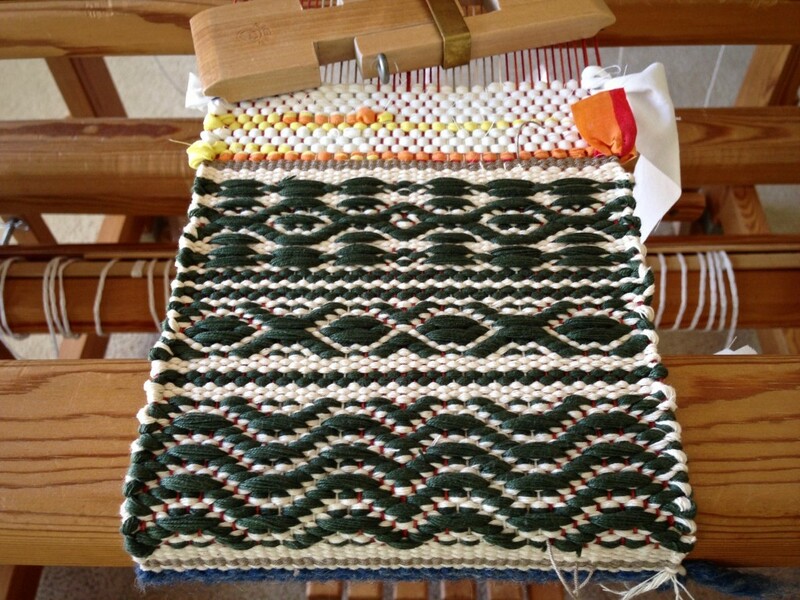 Sampler effect is made by varying the rosepath treadling on this mug rug. You and I are here for a purpose. Though not all the same, every person is significant. Heaven knows your name. And when your name is written in heaven’s book, it’s like a new warp, and all the angels have a party! The cutting off party will be grand, too, with Jesus being clearly pleased at the results of his handiwork. May you make angels sing. What a sweet message this morning, thank you Karen. Janet, how kind of you to say so. Love your blog. it’s great motivation for getting back to my looms. my questions is how do you manage to get so much done? no husband? no kids? i need your secret. Wow, now that you mention it, the brown one does look like stone. I hadn’t noticed that. Cool. Thanks so much for leaving your thoughts! Very nice weaving…with a very GRAND message! God Bless You! Charlene, I appreciate your kind words! Thank you for stopping in. I’ve been looking everywhere for a few tips on rosepath rag rugs and can’t seem to find much online, but your site keeps popping up. Do you mind me asking what size reed and epi you use? I’ve tried a couple of rag rugs in plain weave and twill and found that 12 epi seems to work ok, but your pictures look like a wider sett than that. Thanks for your help! For rosepath rag rugs I use an 8 dent reed (or a 30/10 metric reed), and 8 epi. My warp is 12/6 cotton and I cut my fabric in 3/4″ strips for the weft. 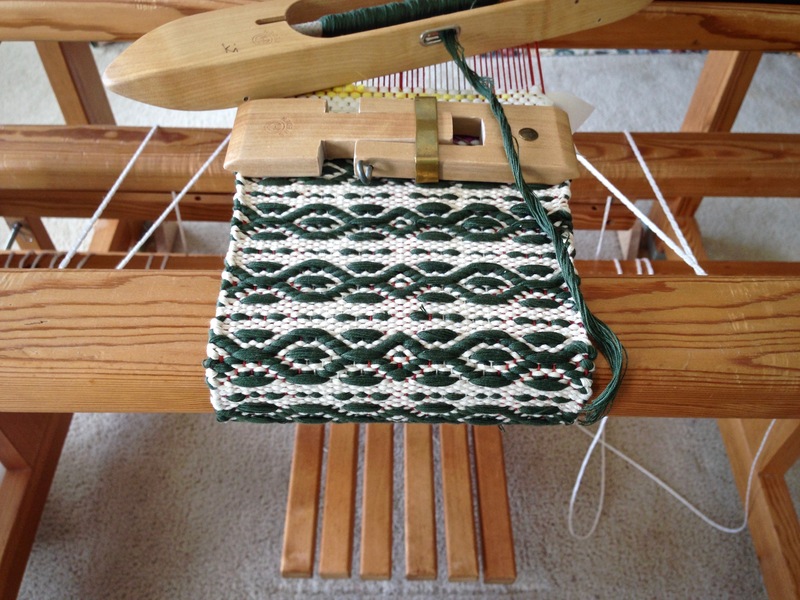 I’m dressing one of my looms for rosepath rag rugs now. I plan to start weaving the rugs by the end of next week. I’m glad you asked! I hope this helps.